Live Event Painting: The Newest Trend in Weddings! Let me capture the essence of your wedding as I paint on site to create an original oil painting. 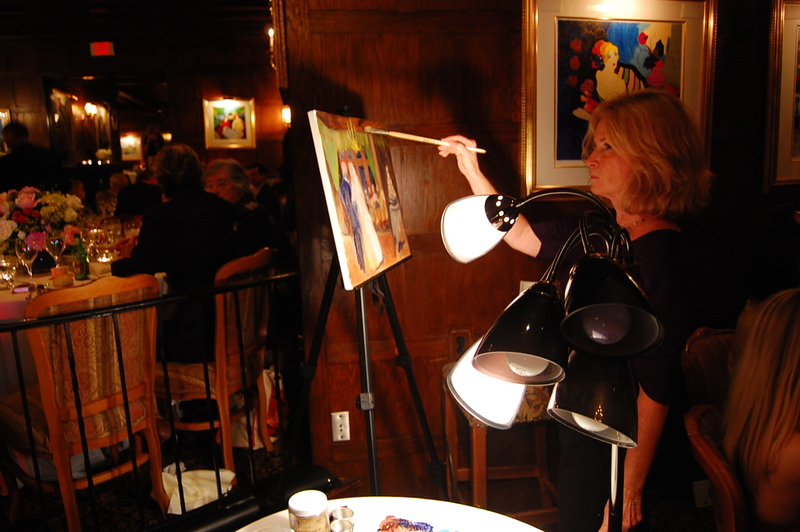 Art brings unparalleled elegance, character, and charm to any event, especially a wedding. I set up about an hour before the event to conceptualize and compose the painting, and I continue to paint as the event unfolds. The start of the painting is created in real time and typically depicts the ambiance and architecture of the room with the bride and groom as the focal point. Outdoor ceremonies and events make especially beautiful paintings. Guests love to watch and interact as the painting comes to life and will remember it as a significant and interesting element of your wedding. By the end of the event, the painting covers the canvas but will require finishing in the studio. I can also create a larger painting at this time. Before the advent of photography, artists recorded important life events in drawings and paintings. These works are treasured for their permanence and artistic merit, as they uniquely captured the essence of a moment in time. This old but new again concept is gaining popularity and is often mentioned in bridal magazines, wedding blogs, and TV programming. Click "Gallery" to view recent paintings of weddings and events. Please also take a look at some of my other work, which will give you a better idea of my painting style. Click "Pricing" for information on costs. My intention when painting live is to capture the moment from my personal artistic perspective. My goal is to produce a high quality fine art oil painting that captures the feeling and mood of the event and that you will be proud to own. I would be honored to provide a proposal to create an original oil painting of your wedding or other event. For additional information, email falynn.artist@gmail.com or call 678-677-5222. Please reserve as far in advance as possible but do call for availability.